April 2018. Scientists from the Schuman Lab at the Max Planck Institute for Brain Research have investigated the variety of structures and functions in non-coding parts of messenger RNA (mRNA) from brain cells. These untranslated regions (UTRs) are essential for regulating the stability and localization of mRNAs, as well as its translation into proteins. The scientists report their findings in the latest edition of the journal Neuron. Our brain’s capacity to learn and to form memories relies on the ability to respond adaptively to environmental inputs. The integration of these inputs occurs at synapses, the connections between brain cells. 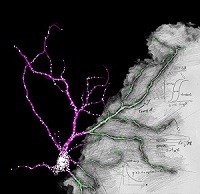 Unlike other cell types in the body, neurons have an elaborate architecture, consisting of axons to transmit and dendrites to receive information. Like all cells, neurons use proteins to carry out their important cellular functions. Neurons supply their processes with proteins by moving mRNA molecules to the dendrites and axons where they can be locally translated. A mRNA molecule consists of a coding sequence in the middle, which serves as a template for new proteins, and two non-coding regions located on both ends: the 3’ region on the right and 5’ on the left hand side. These so-called untranslated regions (UTRs) control gene expression at the RNA level and are variable in length and composition. By acting as binding platforms, they can regulate stability, trafficking and translation, thus dictating the fate of an mRNA molecule within a cell. Figure caption: Fluorescence in situ hybridization against the unique sequence of the long 3’ untranslated region of Camk2a in a hippocampal neuron. Neurons localize mRNAs near synapses where their translation can be regulated by synaptic demand and activity. Tushev, Glock et al. discover a huge diversity in neuronal mRNA 3’UTRs, which give rise to differences in localization, stability, translation, and plasticity. Artwork by Maximilian Heumüller.